Airplanes were new in the early 1900s, and flying was an ongoing lesson. 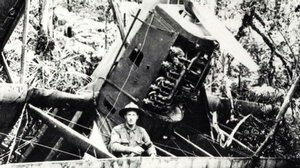 Crashes were common. The Hawaiian Islands presented special challenges. The volcanic and coral terrain was rough, the winds and weather tricky. Pilots had few good places to take off or land. Every flight was an adventure with a real chance of disaster. 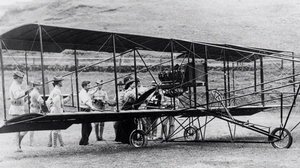 In December 1910, a small group of aviators with a pair of Curtiss airplanes arrived by ship in Hawaii, their first stop on a round-the-world demonstration tour. On New Year's Eve, after much advance publicity and selling of tickets, Bud Mars took off from a polo field near Honolulu and then safely landed. He went up again and again, higher and farther each time. "I find your Hawaiian air currents rather tough ones, but everything else was lovely." 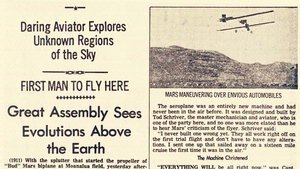 Thousands of spectators paid $1 each (about $25 today) to watch Mars fly several times over three days. 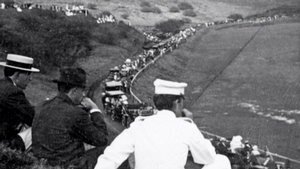 Thousands more watched for free from nearby hillsides. Angered by the revenue lost from all the non-paying "pikers" and "deadheads," Mars' team left Hawaii and continued on to Japan. A fearless flyer, Michigan native J.C. "Bud" Mars performed exhibition flights across the United States and around the world. The flights were a sensation, and Mars was hailed as a hero. 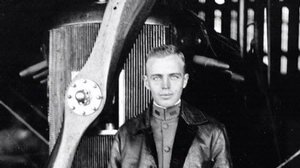 Clarence Walker, a young American aviator, arrived by ship in June of 1911 with an exhibition team planning to tour Hawaii and Australia. 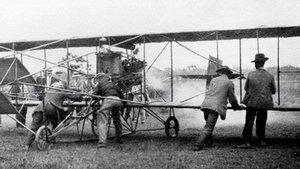 Walker made the first airplane flight on the Big Island of Hawaii, at a horseracing park in Hilo. But even as he took off, spectators heard the engine on his Curtiss biplane misfiring. Walker circled around, trying to coax his coughing plane back to the grassy field. He almost made it, but for a gust of wind. and a telegraph pole once in a while, it in nowise discourages me." 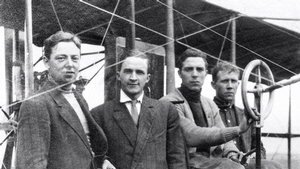 Clarence Walker (third from left) at the controls of his Curtiss Model D in early 1911. 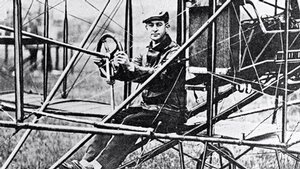 Walker was the first professional aviator from Utah. 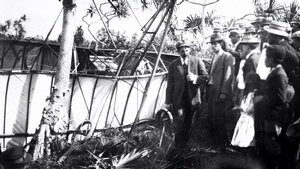 After: The gust blew Walker's plane into a big pandanus tree, wrecking the craft. (Note the tricycle landing gear pointing upward.) He emerged unhurt and climbed a fence to signal he was okay. The fence boards gave way, causing yet another crash. But Walker survived to fly and crash another day. 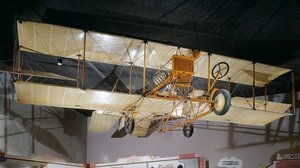 A Curtiss Model D similar to the type of airplane Clarence Walker flew, hangs in the Early Flight gallery. Maj. Harold Clark arrived in the U.S. Territory of Hawaii in 1917 to take command of the Army's 6th Aero Squadron. He quickly began to learn the Hawaiian winds and how to fly in them. 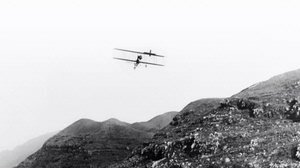 He made the first interisland flight, from Oahu to Molokai and back, in March 1918. Two months later, Clark and Sgt. Robert Gray flew all the way to Kahuli, Maui, where they received a festive welcome. 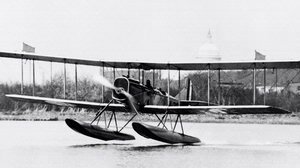 From there they took off in their Curtiss R-6 seaplane toward the Big Island of Hawaii–and then vanished. up to 10:30 o'clock Major Clark had not reached Hilo." Clark and Gray brought their Curtiss R-6 seaplane (similar to this one) down at Kahului, Maui, where they received a festive welcome. They left later than planned. So instead of taking the safer but longer coastal route to Hilo, they flew inland, over the Big Island's volcanic slopes, and ran into thick clouds and rain. With darkness closing in, Clark decided to bring the plane down and crash-landed in the trees. Two days later, searchers found the flyers walking out of the woods, hungry but unhurt. The remains of the plane were later found in a forest on Mauna Kea volcano. 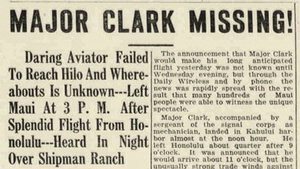 Clark's history-making flights helped pioneer interisland flying. A year later, he died in a plane crash in Panama. Clark Air Base in the Philippines was named in his honor. 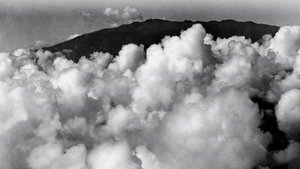 Clark crashed on the cloudy slopes of Mauna Kea. This exhibition is made possible through the generous support of the Conrad N. Hilton Foundation.